Urban landscapes can and must vary across a wide spectrum of types from natural to highly contrived display and educational beds. All will require their own maintenance regime that should minimize impacts while supporting the expression of the particular landscape. Good horticultural practice will minimize negative impacts and costs and is largely ‘determined’ by the design. I took this at Cape Horn in early May ’15 in one of the ‘wet’ woodland ‘terraces’. The native Delphinium gives it a fantastical appearance. If we could create this landscape anywhere in the City I can’t imagine that it would withstand the level of use and inevitable abuse it would receive let alone the ‘weed pressure’ it would suffer. Perhaps there are a few places that such a landscape could work but it would require that we have all of the surrounding landscapes ‘under control’ and that we educate the public so that they would understand and respect it enough to stay away. Our numbers alone even if most behaved themselves would make its survival difficult. Ultimately, this is just what is necessary, re-establishing the public’s relationship with nature and the wild world. (I’ve made earlier postings on this topic, but this piece actually predates those. I wrote this in 2013 while still working as a horticulturist for the City of Portland Parks and Recreation as a member of a Bureau committee that was working to define ‘sustainable landscapes’ so that we could begin to make our policies and practices more consistent with our ‘desire’ to create sustainable landscapes and protect the relatively intact ones that remain. This was a difficult process. We spent a lot of time discussing/arguing about what constitutes a sustainable landscape and ultimately the direction that Parks should be headed. There was a large divide between those of us who saw ultimately, that the only truly sustainable landscape was one that recreated those native landscapes that preceded the massive changes that European Americans brought with them, so that our efforts should be on these, and those of us who, having spent much of our professional lives in the field doing maintenance in created/urban landscapes, arguing that these new landscapes played a necessary role in the modern world and that our designs and maintenance of them could be moved in a more ‘sustainable’ direction. These urban/functional landscapes, whether for active sports, community gardens or even many passive uses, provide places and venues for activities that native landscapes cannot. There is space and need for many different landscapes in an urban area. This is in the garden at South Waterfront Park along the Willamette River and is intended to be a contemplative refuge from the business of the city. It is layered and carefully orchestrated though its goal is more aesthetic than to be a ‘natural’ plant community. It requires considerable regular ‘grooming’ and editing to maintain in order to show off the plants to their best advantage. This garden was designed for multi-season interest especially through the summer when our native Willamette prairie landscape slides into dormancy. The Park enterance, framed by the four bio-swales (I can’t bring myself to call them ‘water gardens’ as they look very ‘un-garden like’) that take runoff from the adjacent hard surface as well as from the drain system installed across the lawn. They are planted with Betula nigra cultivars along with Cornus stolonifera ‘Isanti’, C. s. ‘Kelseyii and an Iris. As you walk through the Park you will move over eight different hard surface treatments! This entry was posted in fill soils, Horticulture, Landscapes, Maintenance, Parks, Plant Choice, Plant Selection, Site Analysis, soil drainage, Trees and tagged Brownfields, Design vs. Horticulture, The Fields Park on April 14, 2016 by gardenriots. Illustration from ‘Pretty Deadly’, written by Kelly Sue Deconnick, art Emma Rios, colors Jordie Bellaire, Image Comics 2015, (007-002). 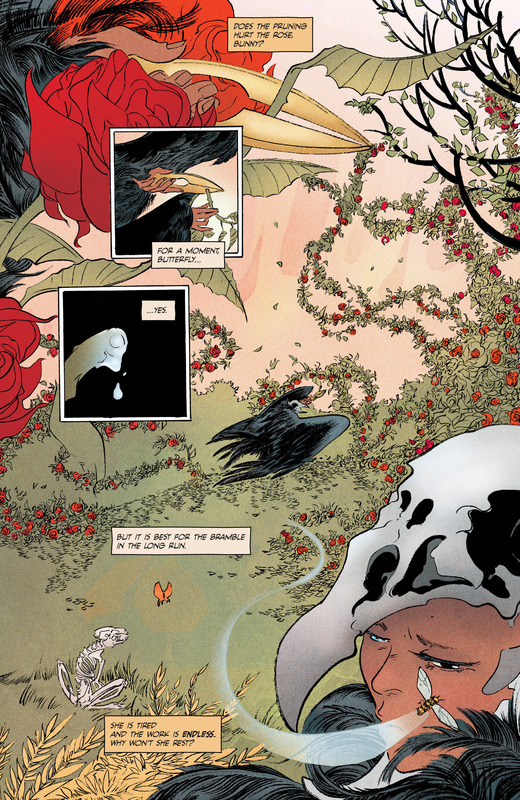 Straight-up classic art, whether oil painting or illustration, like these two pages from a graphic novel that I find beautiful, involve ‘craft and, an understanding of one’s materials and techniques, that are necessary for any artist to create work. In illustration, like this, the art must resonate with the story to be successful. Horticulture and pruning are no different. This entry was posted in Horticulture, Landscapes, Maintenance, Parks, Plant Choice, Plant Selection, Practice, Pruning, Trees and tagged Portland Parks and Recreation, t, The aesthetics of pruning, The Pruning Series on January 5, 2016 by gardenriots.